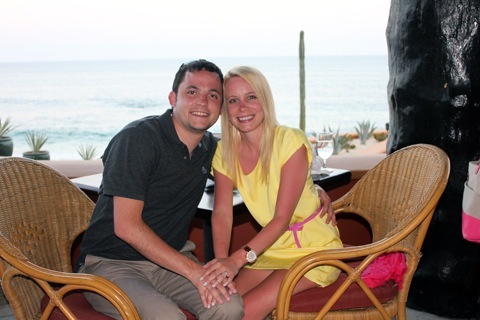 I wasn’t really planning to blog about my honeymoon. I mean, we were totally disconnected from all things digital, including Twitter, email, Facebook, etc. and just completely enjoyed 12 days in absolute paradise. It was heaven. In fact, I didn’t even stress about taking photos, since I just wanted to enjoy myself 100% without thinking about an eventual blog post. But, of course, taking photos kind of comes naturally to me now and we obviously wanted to document parts of our vacation, so we can look back on it for years to come. So, I did end up taking lots of photos. And we had such a good experience with our resort and food (and fun activities) that I had to blog about parts. If you’re ever planning a trip to the area (you should! In fact, lets go together! I’m ready to go back! ), I hope you’ll find our experiences helpful. Our trip started on an interesting note. 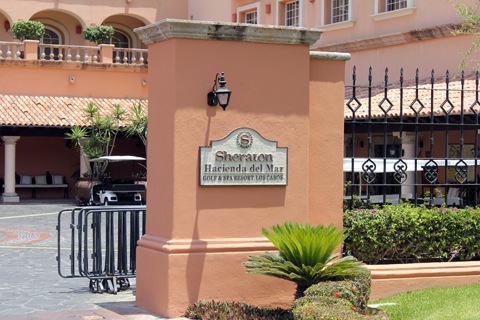 About 2 weeks before our wedding, we got a call from our resort, the Sheraton Hacienda del Mar and were told that coincidentally, the G20 Summit would be in town during our honeymoon. In fact, parts of it would be held at our hotel. Yup, some of the top world leaders were staying at our hotel while we were there for our romantic getaway. According to Guest Relations Manager Angelina Garcia Rendon, there would be lots and lots of security and it wouldn’t be a whole lot of fun for us. At first, we were really upset. We meticulously planned this vacation months ago and now we were being told it would be best to move resorts. Commence freakout. But don’t worry (if you happened to be worrying…), things got better quickly. Angelina let us know that we could stay at the Sheraton for the first part of our stay, then they would move us to another resort for 3 nights, after which we’d come back to the Sheraton (she actually gave us a few options and that’s what we chose). OK, we could deal with that and we figured everything would work out. We were just excited to get there! And when we pulled up, we immediately knew we picked the right place to stay. 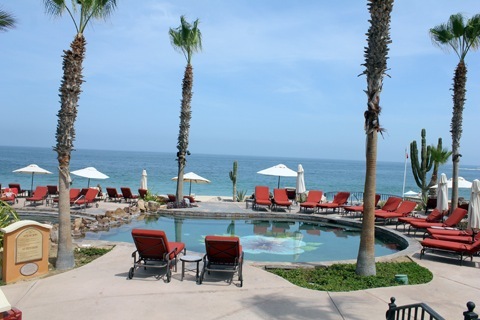 In case you’re wondering, we chose Los Cabos and the Sheraton for a few reasons. A) We wanted to go somewhere we could totally just relax and unwind. We briefly considered Italy, but then realized we didn’t want a “OMG we have to see everything; let’s get up and explore!” vacation and, instead, wanted to have a low-key, restful vacation. B) We’re loyal Starwood Preffered Guest (SPG) members and are big fans of our American Express credit cards that earn us points to stay at Starwood hotels. When we travel, we try to stay at Starwood hotels because we get free stays, earn more points, and love their properties anyway. There’s a huge variety of properties (from Sheraton to Westin to W and more) and they range in price, quality, etc. 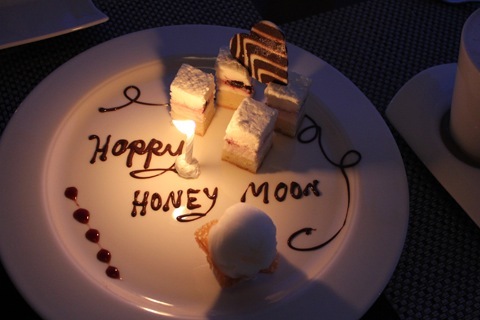 So, from the start, we knew we wanted to honeymoon at a Starwood resort. The points we earned thus far paid for almost our entire honeymoon stay! And we knew we wanted somewhere different than the Caribbean, but we also didn’t want to be stuck on a plane for an entire day. 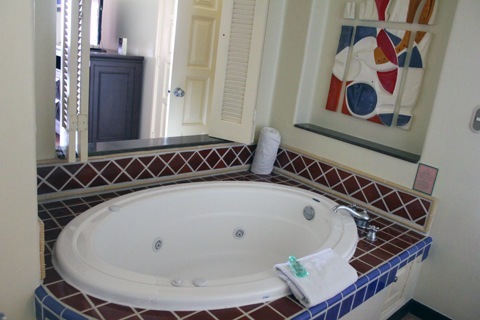 I also really wanted a jacuzzi in the room. It was just one of those things I’ve never had and wanted. It’s the little things, right? We did TONS of research and finally decided the Sheraton looked perfect. After we booked it, we learned that my sister and her husband had stayed there a few years ago and claimed it was their favorite hotel ever. We were psyched with our decision, which is why we were a bit upset by the G20 news. Of all the places in ALL the world, of course, the G20 would take place where we were honeymooning. 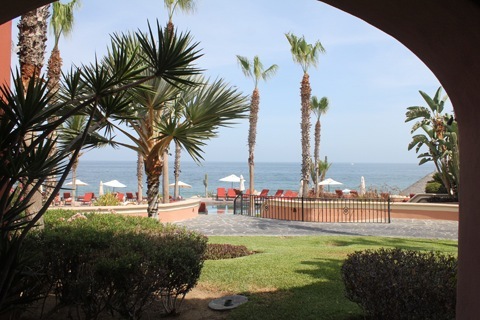 If I could only say one nice thing about the Sheraton Hacienda del Mar (and trust me, there are tons of nice things to say), it would be that the staff is absolutely out of this world. They went above and beyond to make us comfortable and were determined to make our stay as special as possible. And it made all the difference! From the moment we stepped off the plane, we were treated like royalty. Guest Services Manager, Angelinam sent a car to pick us up at the airport and bring us to the Sheraton. They welcomed us to the hotel and had us immediately feeling completely relaxed. Even better, they upgraded our room to a beautiful suite because they felt bad about the G20 disruption! Of course, they left us with a nice bottle of champagne, too. The room was absolutely beautiful (and huge!) and I got the jacuzzi I so badly wanted. 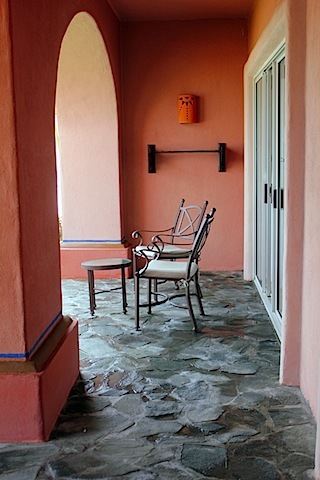 I was pretty obsessed with our patio, too. Which had this spectacular view. There are several pools at the resort and some days, the toughest decision we had to make was which pool to sit by. I’m not sure if it was because of the G20, but the resort was strangely quiet in the days leading up to the summit and we often had pools to ourselves. Our daily routine mostly included laying by the pool. 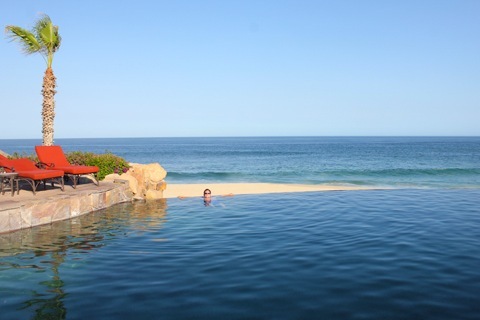 The beaches in Los Cabos are beautiful, but the water is a bit rough and not really fabulous for swimming. And when you have pools like this, it’s tough to tear yourself away. It was my first time in an infinity pool and I can now say I’m a big fan. 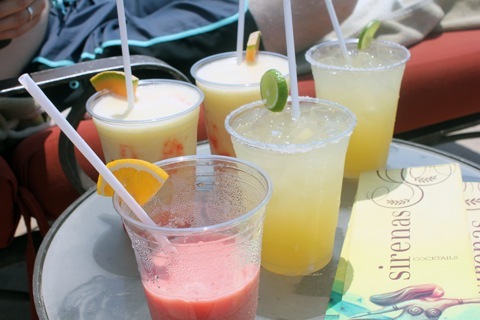 I was also a fan of the pool bar drinks at the Sheraton’s Sirenas. Tops on my list were the Mono Sucio (basically a frozen banana, kalhua-y heaven) and the lava float (basically a pina colada with a shot of strawberry daiquiri). Chris opted for lots and lots of margaritas. Oh, and Happy Hour meant 2 for 1, which is why our table is so packed with libations, in case you’re wondering. But everyone kept telling me I was really in the safest place in the world due to all the security. And I’m sure it was true. I just don’t like machine guns pointing anywhere near my vicinity. 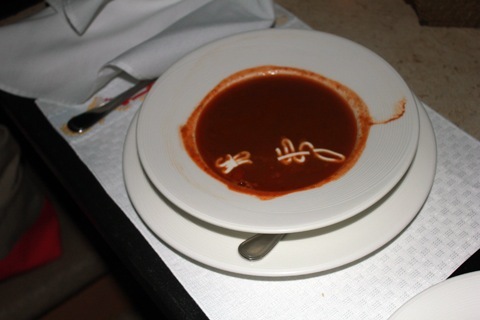 The food at the Sheraton Hacienda del Mar was all to-die-for. 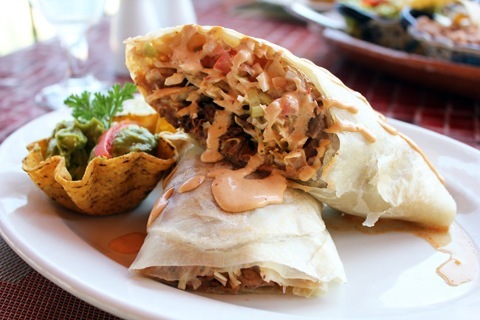 I can get very critical of hotel food and don’t often enjoy staying at all-inclusive resorts (the food never does it for me!). Though the food at the Sheraton wasn’t cheap, I say it was worth the money. 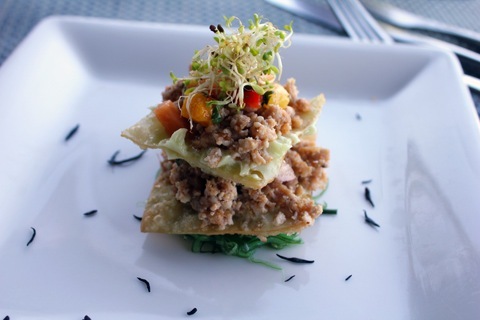 Some of the standouts were lunch and dinner at Girasoles, which we hit up quite a few times during our stay. Ever since I’ve known Chris, he orders a taco salad every chance he gets. But he always seems disappointed by them. He proclaimed Girasoles’ taco salad the BEST ever. I ordered it myself a couple days later and have to say that I agree. 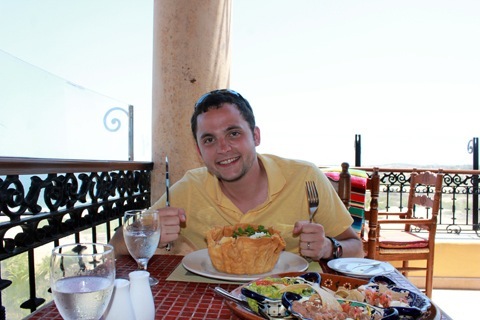 Chris also has a tortilla soup addiction and also proclaimed this one the best. We loved how they served the base. With a separate plate for the add-ins. We added everything in, obviously. The beef enchiladas were also stellar. 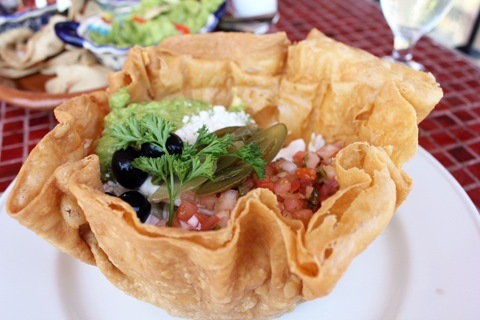 Though I couldn’t eat too much of them since we decided to order the guacamole as an appetizer. 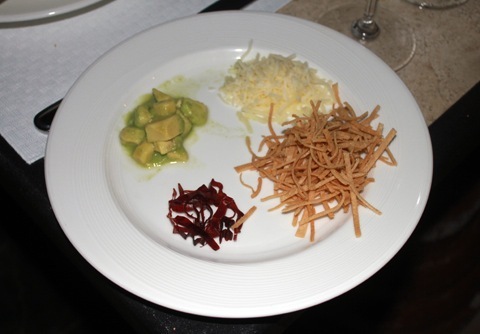 This was the “guacamole.” I’m not complaining; I mean, there was PLENTY of guacamole. But there were also quite a few other delights that came along with it. All incredibly tasty and had me seriously wishing I had just a little bit more room in my stomach. Because I wanted to eat all of it. 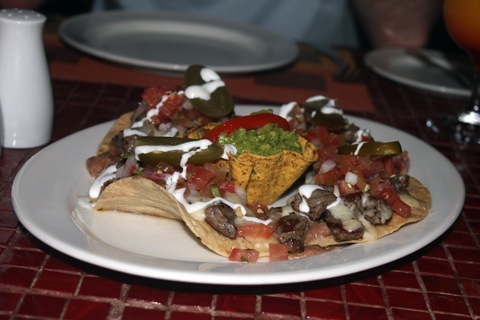 I also wanted to order these nachos at every meal. 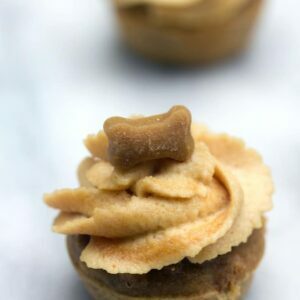 And I desperately want to recreate them at home. 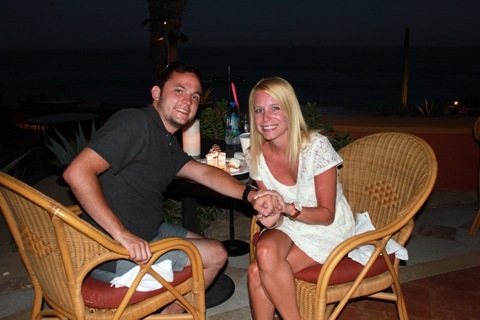 We also had a couple romantic dinners at Hacienda del Mar’s Pitahayas, the award-winning restaurant right by the ocean. Our first involved a passiontini. And a red basil martini. 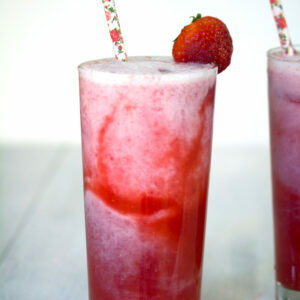 Both delicious and a nice switch from all those frozen drinks. A special amuse bouche from the chef. I didn’t write any of the food descriptions are because I was too busy enjoying the food, so I can’t remember exactly what this was. Some kind of bluefish tostada? In any event, it was a fabulous way to start the meal. 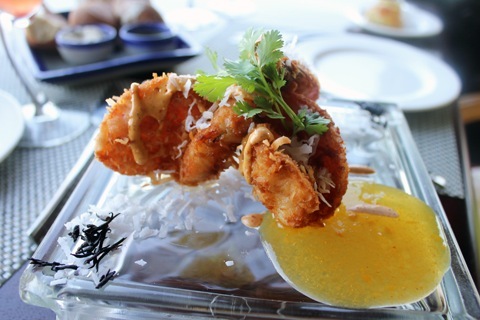 We couldn’t resist indulging in the coconut shrimp with passionfruit gelee. 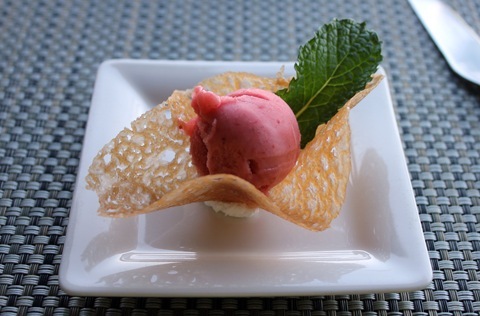 Really, I can’t help but love a restaurant that serves sorbet in between courses. 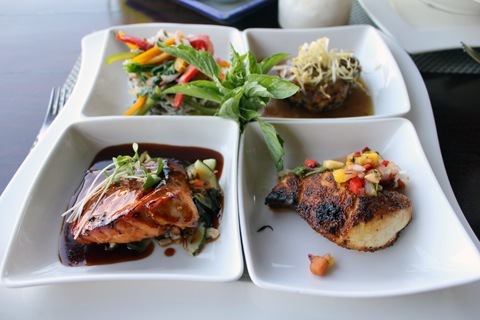 For an entree, Chris got the fish trilogy, which included three kinds of fish cooked three different ways. Hello. 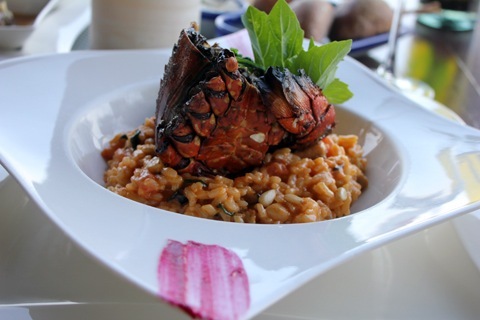 And even though I live in New England, I was tempted by the lobster risotto. And I’m glad I was because it was seriously awesome. The lobster was plentiful and the risotto was one of the most flavorful I’ve ever had. The presentation for everything was OUT OF THIS WORLD. 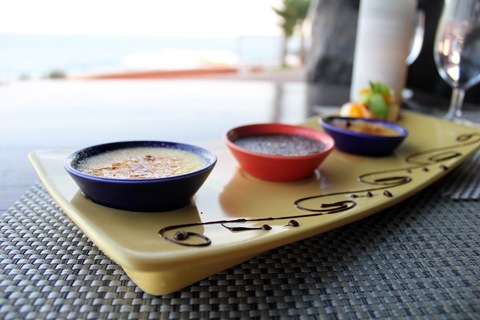 Not being the type who says no to dessert, we had to order the creme brûlée sampler. And we ate every bite. This was one of the first nights of our honeymoon and we were beyond happy. And relaxed. And all those other good things I haven’t fully been in a while. Vacation is the best. On our last night of vacation, we returned to Pitahayas. 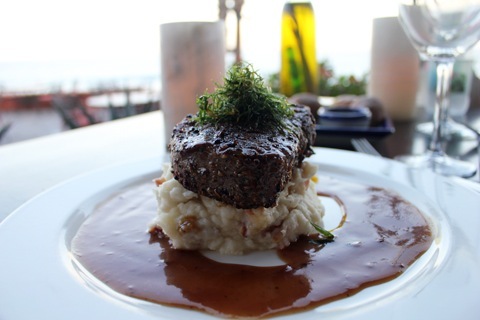 This time, Chris got the filet mignon, which came with lobster bacon mashed potatoes. Yes, you heard me right: LOBSTER BACON. 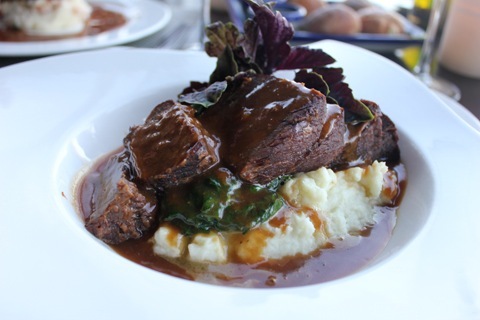 And I decided on the braised short ribs, which were incredible tender and flavorful. This time, our dessert involved cheesecake and a beautifully decorated plate. So sweet! 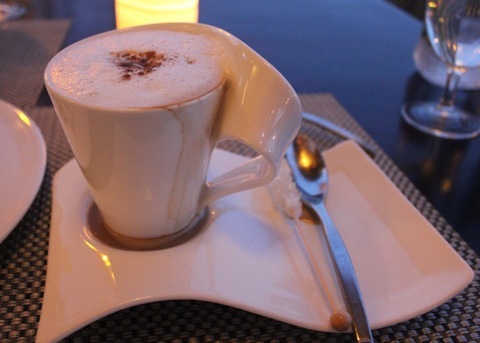 Plus these super snazzy cappuccino cups, which I seriously want to own. It was the last night of our vacation, but we had no complaints. And I think we both got our share of sun, too. Honeymoon success. 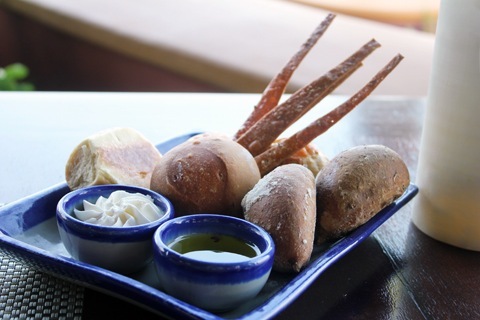 You will end up spending a bit of money at Pitahayas, but in our mind, the food was well worth it. The beachfront location is perfect and you absolutely cannot beat the views. It was very quiet during our stay (despite the G20 business) and both times we dined at Pitahayas, we were one of the only couples. I’m not going to lie; we spent a lot of time at our resort, just being on vacation and relaxing. But we did leave a few times to explore the local area. One evening, we decided to go on a dinner cruise. 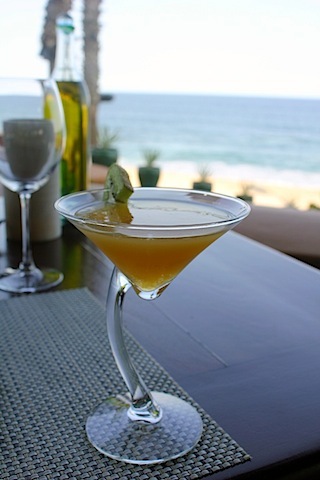 The Sheraton’s concierge recommended Cabo Mar to us, so we signed up. The boat cruise was a great way to see some of the area attractions while sipping on some drinks and having lots of fun. We finally got to see the famous Arch. 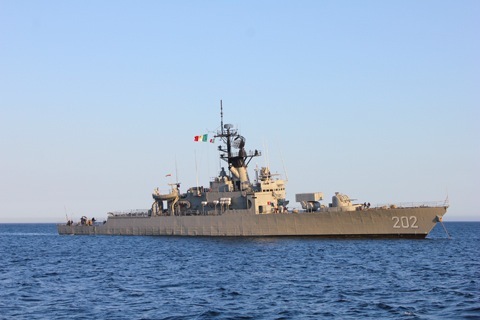 And oops, some military ships, too. Hello G20 security. We saw boats from many countries throughout the week. The weather was perfect…. Not that that comes as any surprise. We were told it only rains in Cabo about 4 times a year. Sounds like heaven to me! The boat cruise also involved a super casual and authentic dinner, which we both really enjoyed: tacos, guacamole, rice and beans, and more. Followed by lots of dancing. We saw the beautiful sunset and caught our hotel’s shuttle back to the resort at the end of the evening. Another day, we headed to town and just walked around the marina. We heard that taxis can get very expensive in Cabo (especially if you don’t know what you’re doing) and that renting a car can generally be more cost-efficient. So we rented a car a couple times and also took advantage of the Sheraton’s $10 shuttle that ran every 90 minutes. I loved the marina. But I didn’t love being asked to buy something/take a tour/etc. every single step we took. It turned into kind of a joke between Chris and I trying to see how long we could go without anyone hassling us. It wasn’t long. And then another day, we swam with dolphins. If you know one thing about me, it should be that I’m a major wuss. I like my vacations to include pools, books, sleeping, sun, and food. Not adventure. 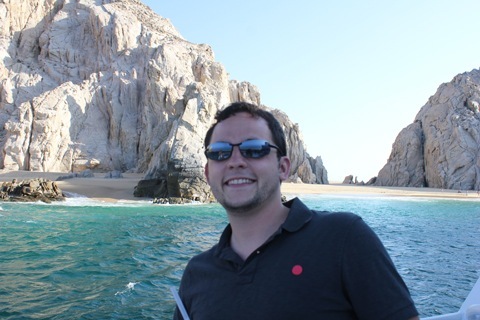 But I knew that with 12 days in Los Cabos, we’d have to sign up for an activity or two, so when Chris mentioned swimming with dolphins, I agreed. 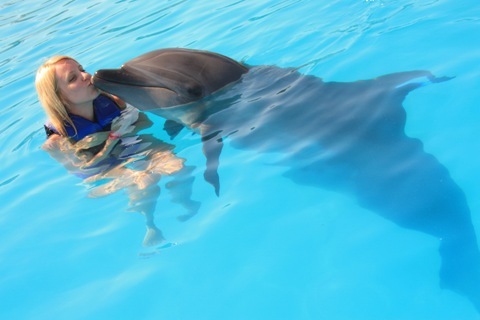 We headed to Cabo Dolphins where we spent an hour in a pool with some beautiful dolphins and their trainers. 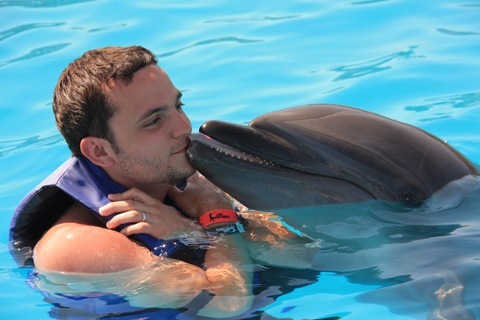 Yes, I was nervous; but the dolphins were so darn friendly, I just went for it. Until she decided to spit water in my face. It’s unclear on whether I’m laughing or crying in this photo (just kidding; I’m laughing). 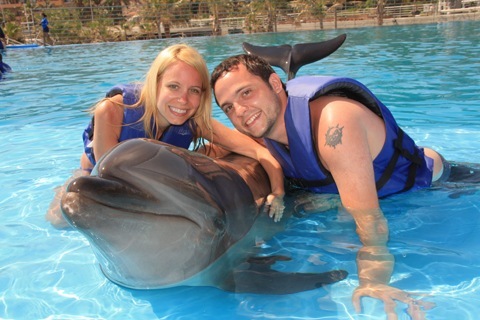 And we got to actually ride the dolphins around the pool. 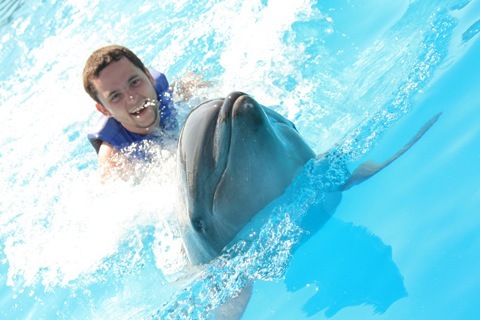 I never imagined myself grabbing onto a dolphin’s fin and swimming around a pool, but it was a blast! The dolphins were far more friendly and well-trained than I could have ever imagined and once we got in the pool, I felt entirely safe. 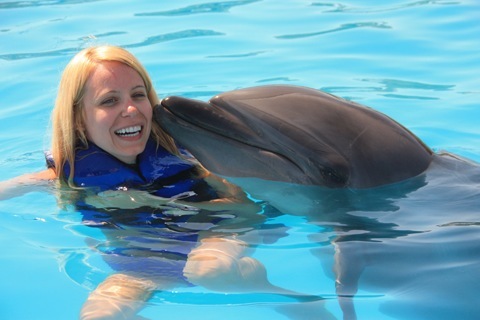 So glad I got to experience swimming with dolphins! I definitely recommend this activity for anyone visiting Cabo who isn’t a huge fan of crazy adventure, but wants to experience something cool. That’s it for now! I have a part 2 post coming some time next week with a little bit on the other resort we stayed at during our honeymoon and lots more food! 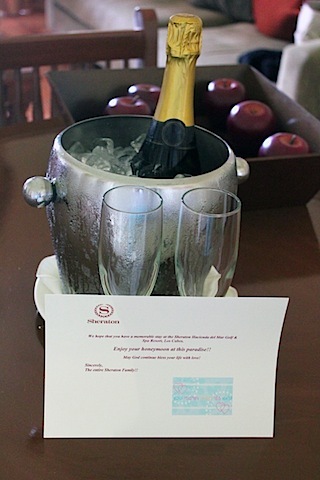 I have to give a HUGE shout-out to the staff at the Sheraton Hacienda del Mar and especially Angelina who made our honeymoon the best ever. We can’t thank her enough for making us feel at home every step of the way. I have a feeling we’ll be returning to the resort in the future. Until then, I will be dreaming about it! 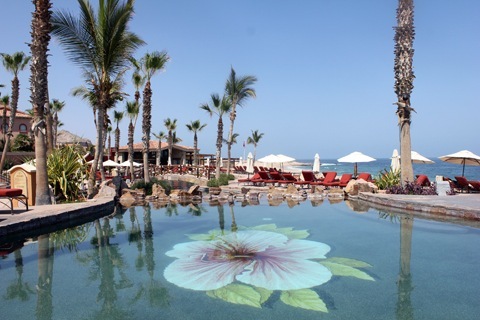 Have you been to Los Cabos (or anywhere in Mexico)? What was your favorite thing about it? 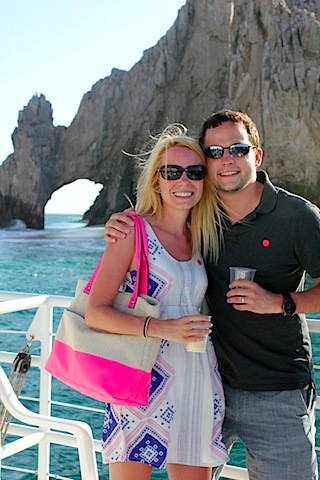 30 Responses to "Honeymoon in Los Cabos, Mexico (Part 1)"
what an amazing honeymoon! I swam with dolphins in Islamorada (Florida keys) when I was a kid. its a pretty cool experience. so glad you enjoyed everything you did!!! so fun! i shouldn’t have looked at this post before lunch, all that food looks amazing. Your pictures are absolutely amazing! I have never been to Mexico, but I have had super good luck following in your vacation footsteps so you never know whats to come 🙂 Also, can you please tell me where you got that beach bag with the pink at the bottom? I love it! I really enjoyed reading this, you guys had a fantastic time! 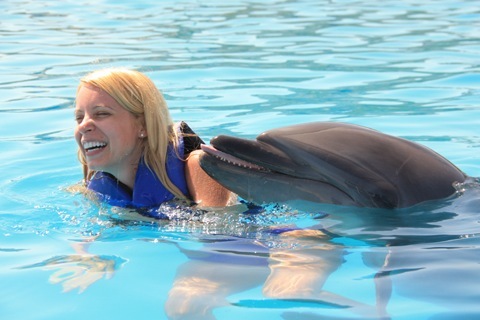 And how cool is it that you got to swim with the dolphins?! I haven’t been to Mexico yet but definitely want to. Amazing photos! Looks like you had a beautiful honeymoon. Congratulations! looks amazing! now I am hungry, and I want that lobster bacon! Great photos! Looks like a perfect honeymoon! Congratulations!! I’m sure the G20 situation was stressful, but it makes for a great story 🙂 The food sounds incredible! Can I come next time? The food looks so yummy. And I love all your outfits and that pink bag. So fun. 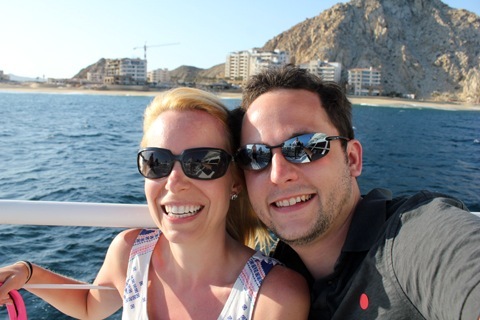 My aunt and uncle have a time share in Cabo…I went a few years ago. I LOVED everything about it! We went in January which is a great time to take boat out whale watching!! The boys also went Marlin fishing on a catch and release boat which they said was also amazing! I could just sit out on that patio for 12 days! 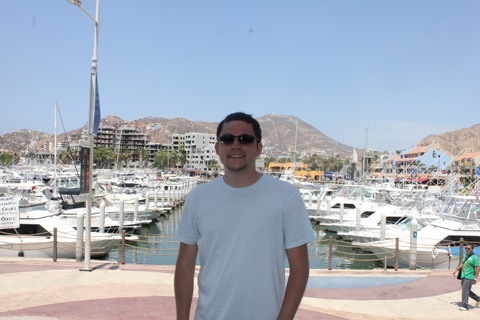 We went to Mazatlan several years ago. The water temp was heaven and the people were so nice! 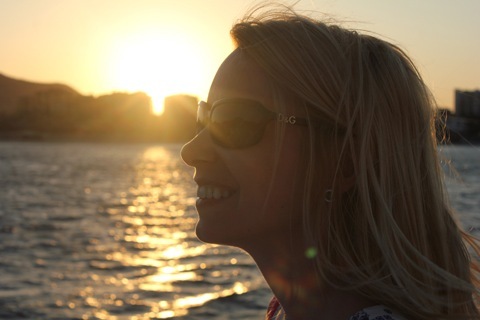 Thanks so much for this recap Suze – sounds like you guys had a great trip! Aw your honeymoon looks absolutely lovely! 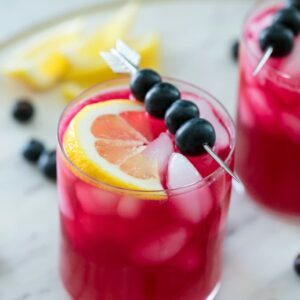 Love all the fun pictures and seriously makes me want to go to a pool with a fruity drink right this second. Thank you for sharing this with us – it looks like you had a glorious time! 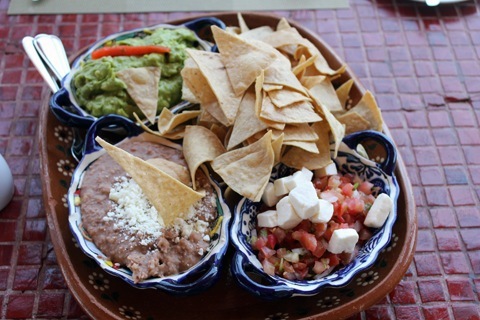 Now to the food….I am having a serious mexican craving like you wouldn’t believe. @Kelly- You totally need to follow in my footsteps again!! 🙂 The bag is Kate Spade, but I got it from the outlet a few months ago, so I’m not sure if it’s still available. I saw it and couldn’t resist! How crazy that the G20 coincided with your trip! I’m glad it ended up being amazing nonetheless. You look very happy! Hiya, I’m really glad I have found this info. Today bloggers publish only about gossips and web and this is actually frustrating. A good blog with exciting content, this is what I need. Thank you for keeping this web site, I will be visiting it. Do you do newsletters? Can’t find it. ps: i’ll be in B-town in August for the Healthy Living Summit!!!!! SO fun! Looks like you guys had fantastic weather while you were there, too. Absolutely awesome…talk about living the life of royalty! So glad that everything was so perfect…such a special way to begin your life together. You deserve the best! Hope to see the happy newlyweds soon! This post is incredible. Not only do I feel I have been here before, I now want to return for another visit…anyone want to come along? The two of you look amazingly happy and are beaming with contentment!! May this be the start of an extraordinary future together!! 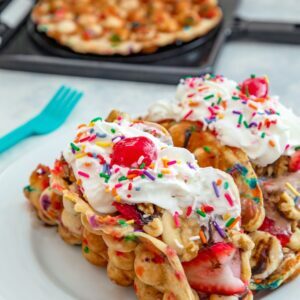 Looks like a great mix of good food, relaxing, and fun! Glad you had such a good time! Just so awesome! I wish I could go on a vacation like this too! I had fun looking at your photos, especially the food! drool! 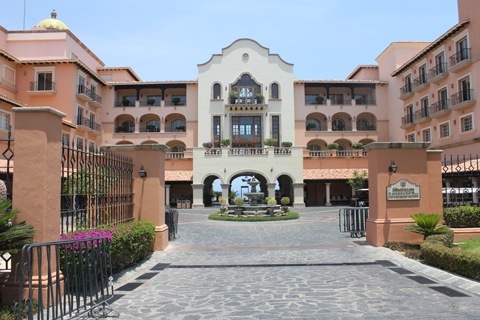 We were just at the Hacienda del Mar for the day in July after having stayed there before. You are absolutely right- the staff is what makes the beautiful hotel even more special!! You guys are too cute together! I loved reading this and seeing all the pictures..looks like you had a wonderful trip and congratulations! 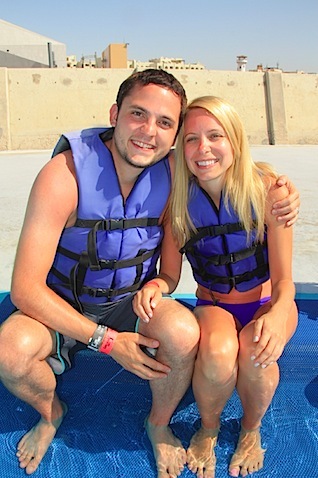 I can only hope my honeymoon will be as relaxing and fun as yours looks like it was! 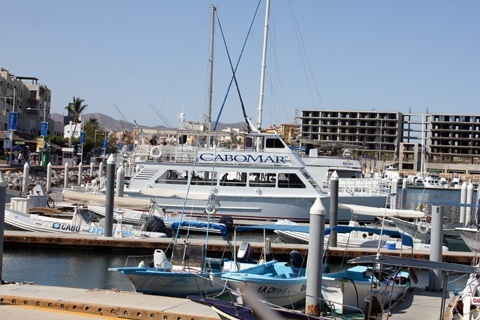 It looks so great in Cabo. What a great honeymoon! 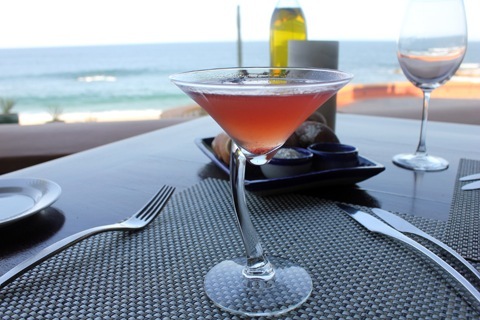 If you ever decide to come back to Cabo for a second honeymoon we would love to spoil and pamper you.